The most obvious change in this modern classification is the disappearance of minerals, indeed systematists do now rank only living things therefore exit the mineral kingdom. Viruses are also excluded from this ranking, although having DNA and that they can multiply and evolve, viruses have no metabolism. 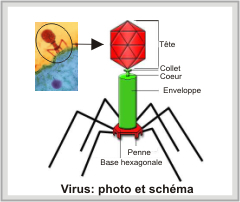 One could define viruses as nonliving entities that multiply by recycling the organic material of their hosts (they seems like small robots!). Some designations of groups of living things are found in this ranking, fragmented over several kingdoms, this is the case, among other for algae: red and brown algae are among the Protist, blue-green algae (cyanobacteria) with Bacteria, and finally green algae are classified by some authors with the plants. The kingdom Animalæ being excluded by definition of a flora, I will briefly describe the other four kingdoms included therein, the Bacteria, Protist, Fungi and Plants.